How to view a PDF with more than 2 pages side by side? I have a wide screen that has enough space to show more than 2 pages side by side. In MS Word, zooming out seems to achieve this, but I couldn't find a way of doing the same with PDFs. This is on Mac OS X, and I tried Preview and Adobe Acrobat Reader DC. Both can show 2 pages side by side, but nothing more than that. Any ideas on how to do this with these tools, or any other tool that would work on Mac OS X? 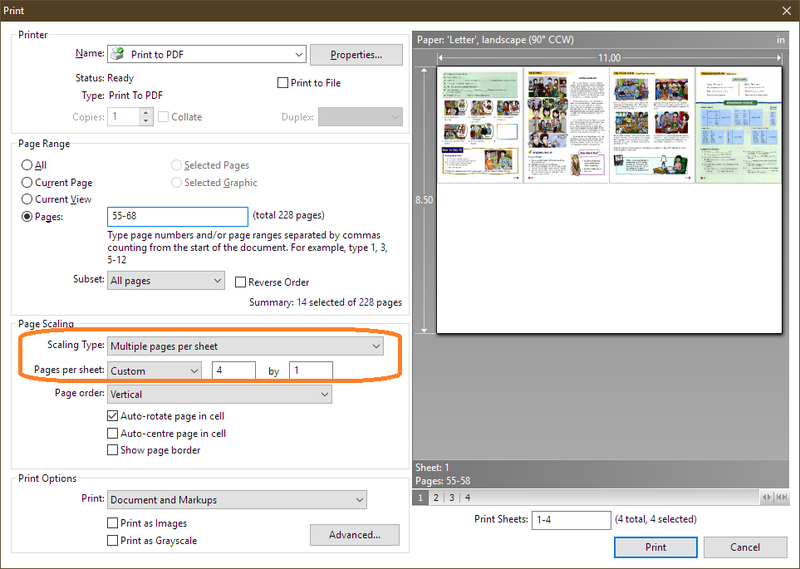 Use Wrapped Scrolling option in Mozilla Firefox's built-in PDF viewer. Open your PDF file in Mozilla Firefox browser. On PDF document toolbar (above the document view) open menu >>. See the screenshot. Select Wrapped Scrolling menu item. Zoom your document out to see as many pages as it fits into width of the view. Start a second instance of the Adobe viewer, or, if that's not possible, use the installed PDF viewer and also a third-party reader. Of course, that means trying to sync reading in both, but on the other hand, it allows comparison of different sections within the same document or of multiple docs. To do this, I use Acrobat Reader. This is not close to something I would call THE solution, due to a number of factors (I will play down my own answer itemizing these below). But it is the closest I got when trying to do the same thing! In particular if trying to change the view on-the-fly. You need Microsoft Word (#1). Open the pdf file. There may be some things that do not show up exactly as in the pdf, in particular if it has many images (#2). But it may give you a good bird's eye view of the document, which may be your main target given that having several pages side-by-side does not allow for much more than this. Go to View -> Multiple pages (in Spanish here). 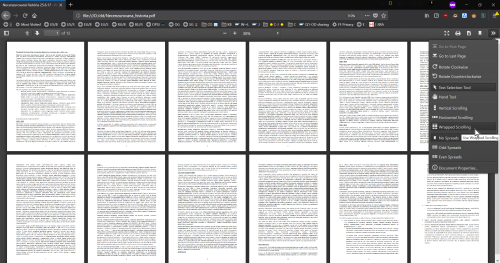 Then set the Zoom level that gives you the number N of side-by-side pages you want, depending on your monitor size and resolution, and Word reading pane size. Say you have 3 side-by-side pages at the current zoom level, your pdf will be displayed 3 pages per row, and you will scroll down across this layout. You will not be scrolling horizontally across pages in a continuous manner (#3?). This may or may not be what you want. Generate a pdf N-up file. There are a number of ways to do this. 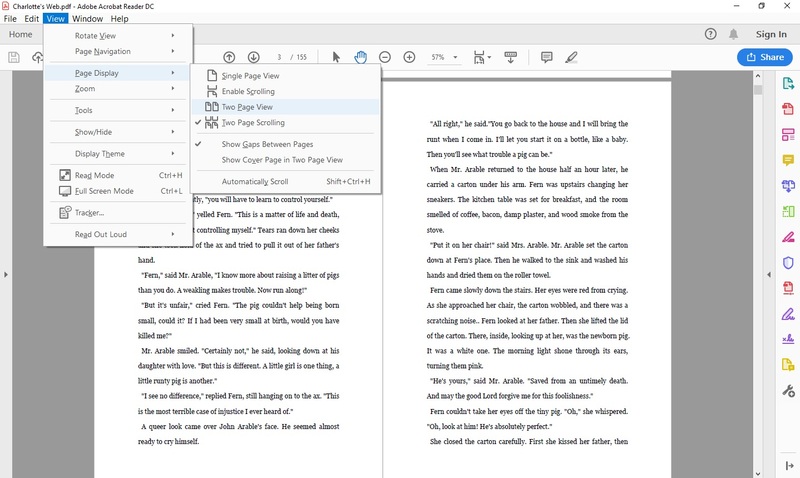 It will create a "fixed" view (with fixed number N of side-by-side pages), and you would have to generate a new pdf N-up for each N.
Adobe Acrobat allows for this printing. There is also pdfnup. I do not have MacOS, but I guess it should work. Its advantage over Adobe Acrobat is that you can do batch processing. This may make your life easier. Not the answer you're looking for? Browse other questions tagged macos pdf or ask your own question. How can I disable paid features in Adobe Reader DC without also disabling access to the Document Cloud?